Get a free gift bundle (over $500 value) and $100 mail-in rebate with purchase of the performance icon™. $500 mail-in rebate with purchase of the Creative icon™. 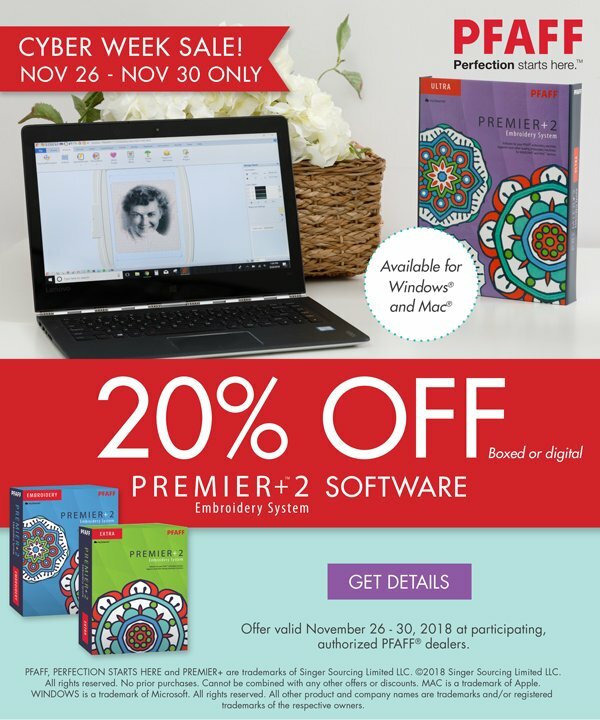 This week only, enjoy 20% off PREMIER+™ 2 embroidery software (boxed or digital)! 20% Off In-stock Go! Dies - Extended! 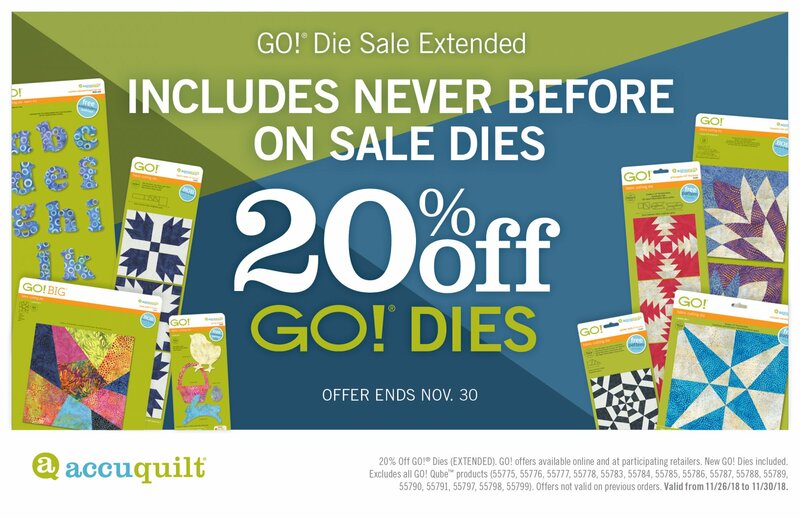 20% Off Dies has been extended to November 30th and now INCLUDES the NEW Dies!! Offers not valid on previous orders. 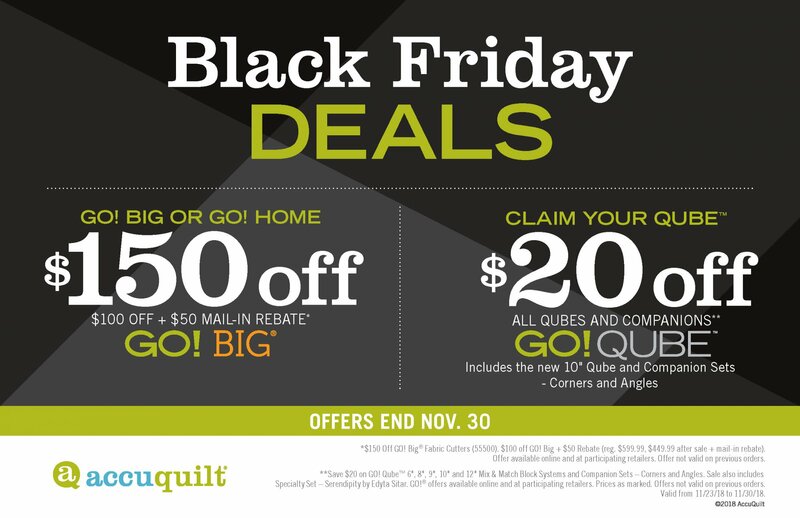 Black Friday Deals on Accuquilt! $100 off GO! Big + $50 Rebate (reg. $599.99, $449.99 after sale + mail-in rebate). Offer not valid on previous orders. Valid from 11/26/18 to 11/30/18. Sale also includes Specialty Set – Serendipity by Edyta Sitar. 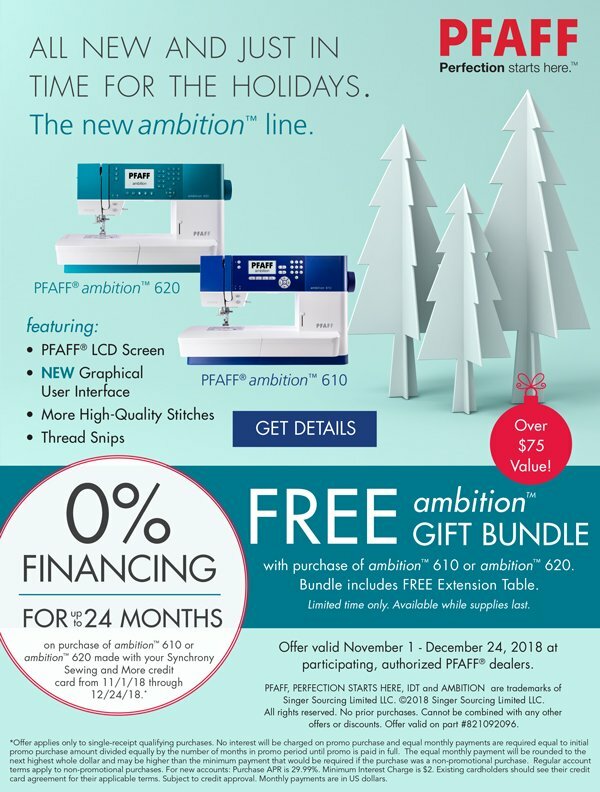 Get a FREE gift bundle (over $75 value) with purchase of ambition™ 610 or ambition™ 620 sewing machines. Bundle includes Free Extention Table. Our First Multi-Needle Embroidery Machine is Here! 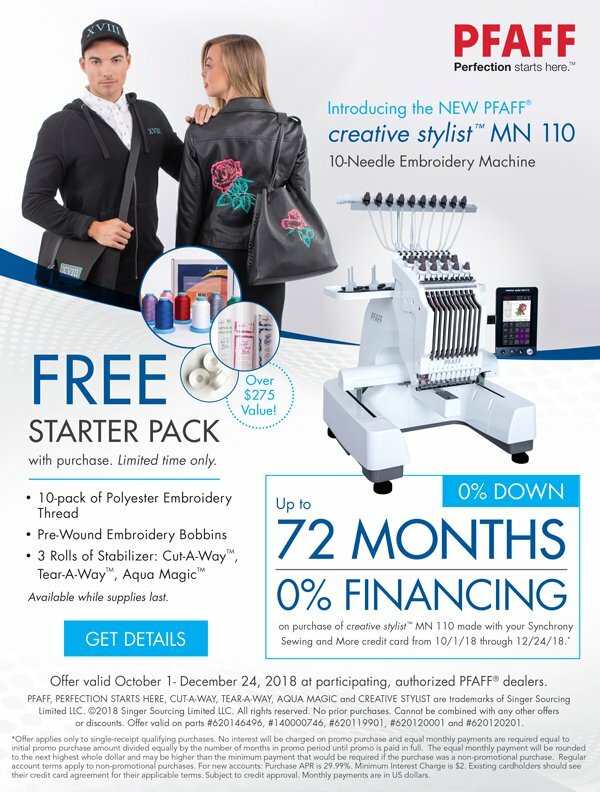 Order now and get a FREE Embroidery Starter Pack (over $275 value), while supplies last. For a limited time, get up to 72 months 0% financing! The new expression™ 710 and quilt expression™ 720 sewing machines are here! 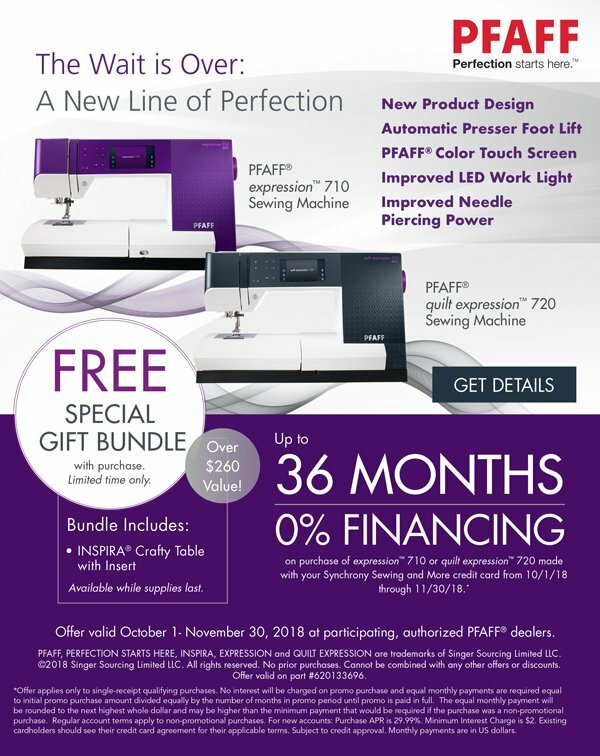 Receive a free INSPIRA™ Crafty Table with Insert (over $260 value) with purchase of either the expression™ 710 or quilt expression™ 720! Plus, receive up to 36 months 0% financing. Contact your local authorized dealer for details. We service ALL brands of Sewing, Embroidery, and Sergers! A surprise awaits you, come join our new 'Mystery Quilt Friendship Connection." This lecture/demo class offers an installment to a mystery quilt every month. The Mystery quilt will be taught over a 6 month period. The first month you will receive the supply list and the last month find out how it goes together. Come on down and sign up today it is not too late to join in the fun. Saturday, December 15 Time 1-4. PFAFF Embroidery Club meets once a month on the third Saturday of the month. 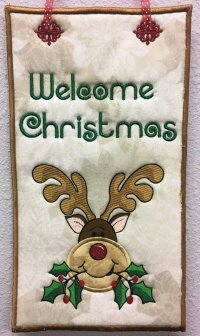 Each month we do a new in the hoop project or embroidery. This class is only for the Pfaff Embroidery machines Vision, Vision 5.5, Creative 4.5, Sensation, Sensation Pro, Sensation Pro 2 and the Creative Icon. You have to know the basics of your machine. There is a limited amount of space so I need to know who is coming. In November we did the cute Christmas sign. Rudolph was designed by Smart Needle. The letters, buttonholes, and outer satin stitch are from the Premier+2 Software! Thank you for being our customer! We appreciate every single one of you!